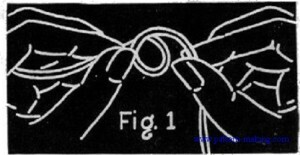 Chain stitch-first make a loop just formed (which will be referred to as a lp), by grasping thread, one or two inches from end, between thumb and forefinger of left hand; holding main length of thread in right hand, bring it across in front of short end, forming a ip as shown in (Fig.1). 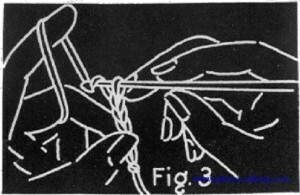 hold crochet hook in right hand as shown in sketch, insert hook in lp just formed, catch main length of thread and pull through lp (fig. 2). 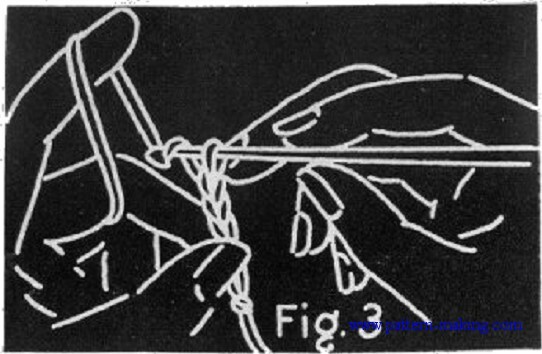 Pull both threads to tighten lp on hook. You are now ready to make first ch St. Do not remove crochet hook from thread. 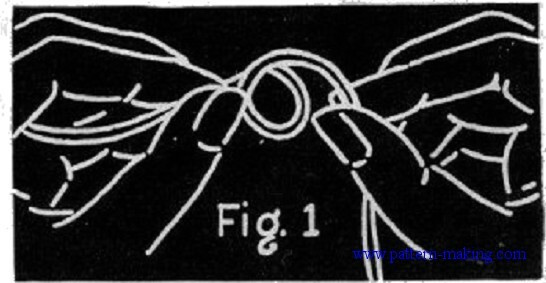 Hold hook in right hand as shown in Figure 3, hold main thread in left hand, wrap thread once around little finger, bring thread in front of ring and middle fingers and behind forefinger; hold Ip between thumb and middle finger of left hand, pass hook under thread and pick up this main length of thread on hook-called a “thread over,” with one motion, draw through lp for a ch St. For practice make a ch any desired length; on this foundation ch you can work nearly any st you wish. To make the second or following st always insert hook in next st on ch of previous row, skipping the sts necessary at beginning of ch or row as explained in each St.